Alan Mattingly was Director of the Ramblers' Association in Britain from 1974 to 1998. A member of the Outdoor Writers' Guild, he received that organisation's Golden Eagle Award in 1998. 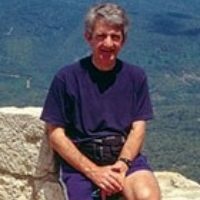 His previous publications include Tackle Rambling (1981), Walking in the National Parks (1982) and Walking in the Cathar Region (Cicerone, 2005). He is now based in Vernet-les-Bains, in the eastern Pyrenees. There, he teaches English, writes - and is at last able to spend much more time in the great outdoors than was possible when he led a walkers' organisation based in central London! He has spent recent years exploring in detail country where the famous Cathar castles of southern France are located. These medieval fortresses are mostly perched on vertiginous limestone pinnacles and command fantastic views of the surrounding hills, mountains, forests and vineyards. In the thirteenth century they gave shelter to the Cathars, a heretical sect of Christians who defied, but who were ultimately crushed by, Church and Crown. "Their history," he says, "is full of drama and mystery. It is as fascinating as the landscape in which it all took place."